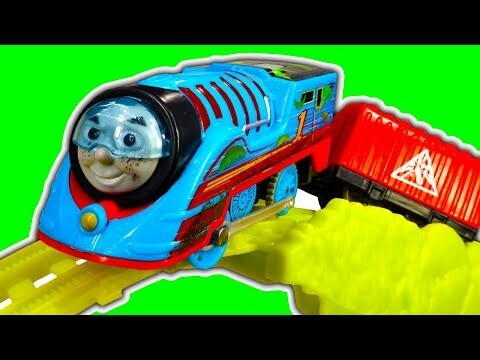 Thomas The Tank goes STREAMLINING TURBO. 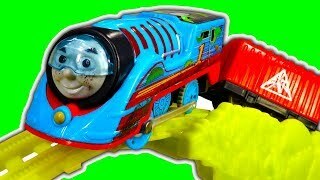 Lets investigate the Thomas & Friends Turbo Jungle Trackmaster playset that's inspired by Big World Big Adventures move. This is a large toy train set that incorporates some exciting features. The Thomas in this set is different to the standard Trackmaster Thomas toy, It's a stylized Streamlining Thomas with special triggers underneath that enable a burst of double speed. This requires a special trigger track section to create the turbo speed. As I found out this playset is fun, the train catapult on the layout sends Thomas on a rocket ride through the Inca Temple Of Doom that would be packed with treasures. I started having the best fun by putting on rolling stock and other Thomas trains. All in all this is a very different Trackmaster Thomas set. Below is what Mattel / Fisher Price say about this toy. Inspired by the Thomas & Friend movie, Big World! Big Adventures, the Turbo Jungle Set features a motorized Thomas train that can travel up to 2.5 times faster than normal TrackMaster™ engines. Plus, Turbo Thomas will complete an amazing stunt as he launches off the rails and soars through the air into a jungle temple! In the movie Big World! Big Adventures, Thomas travels around the globe to discover new destinations. In South America, he journeys through the jungle, and this train set helps kids relive those thrilling moments. Not only does the set include a Thomas engine that can travel faster, it also comes with two Booster Tracks that let kids control the speed. Flip the switch on one Booster Track so the color turns green, and when Thomas passes over, he'll launch into Turbo mode. When a Booster Track is switched to yellow and Thomas passes over while in Turbo mode, he'll slow back down. Kids can experiment with different speeds as they send Thomas zipping around the big bank turn towards the grassy slope. Then he'll launch up a hill, off the tracks, and soar through the air into a temple! For even more ways to play, kids can also send Thomas down the hill below the temple and knock over the trackside palm trees. Toy train set includes full track layout with falling palm trees, big bank turn, two Booster Tracks and Turbo Thomas motorized train that can travel up to 2.5 times faster than standard TrackMaster engines. Thomas can launch into the air and soar through the jungle temple. Flip the switch on Booster Tracks to change the color from green to yellow. To make Thomas travel faster in "Turbo" mode, send him over the Booster Track while it's switched to green. To slow Thomas down from "Turbo" mode to normal speed, send him over the Booster Track while it's switched to yellow. Thomas features unique streamlined jungle designs. The TrackMaster Turbo Jungle Set offers exciting, fun-filled play that can encourage physical and cognitive development. Grasping the train, flipping the switch on the Booster Tracks and connecting the track pieces can promote fine motor skills. Plus, as children use the Booster Tracks to experiment with different speeds and figure out which speeds work best for different situations, it can foster thinking skills and understanding of cause and effect.